Showing results for tags 'beets'. Celiac.com 04/03/2019 - Butter and shallots join with beets and chard to perform a delightful dance in this tasty dish. The real star, however, is the Bucheron cheese. 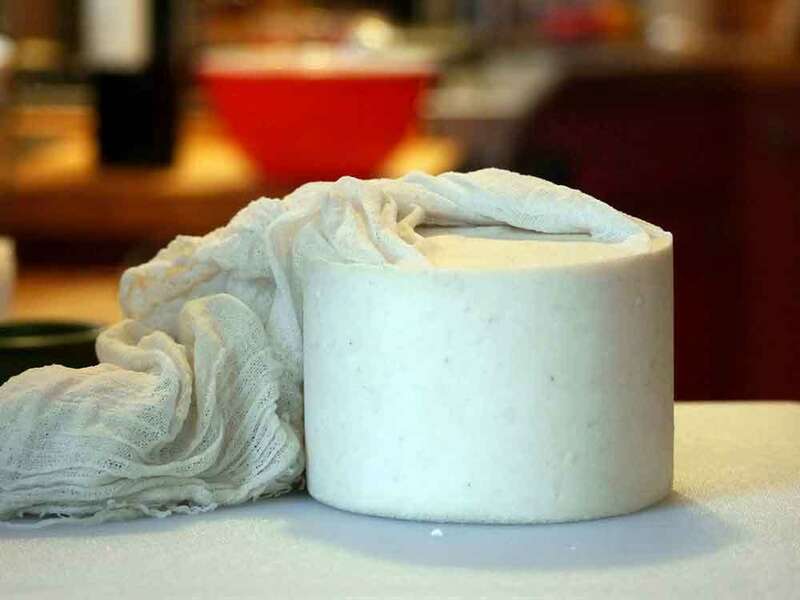 Other goat cheese will do in a pinch, but try to get the Loire river valley original. You’ll be glad you did. Ingredients: 4-6 beets with greens 1 bunch Swiss chard 3 tablespoons butter 1 shallot 1 pinch Salt, or more to taste 1 pinch Freshly ground pepper, or more to taste 2 tablespoons white wine 2 tablespoons water 8 ounces Bucheron, or other goat cheese (at room temperature) 1 loaf gluten-free bread, warm (I use Bread Sriously’s Gluten-Free Sourdough) Directions: Scrub and peel the beets. Remove the greens and chop coarsely. Set the greens aside in a large prep bowl. Slice beets into ¼-inch rounds. Remove the ribs from the Swiss chard and coarsely chop and toss into bowl with the beet greens. In a large sauté pan, melt butter. Lightly sauté shallots. Add beet rounds to the shallot butter mixture. Crack some pepper over the beets and a toss on a pinch of salt. Reduce heat and sauté beets, turning over to ensure even cooking. Cook about 15 minutes until beets begin to glaze and become tender, then add greens and chard. Sauté for about 5 minutes, then add wine and cover. Cook until greens are wilted, adding water if necessary. Allow liquid to be mostly absorbed into greens, adjust seasonings. Scoop greens and beets into a low shallow bowl. Garnish with a wedge of bucheron, or other goat cheese, and some good gluten-free bread. Add a dash of pepper over the entire dish. 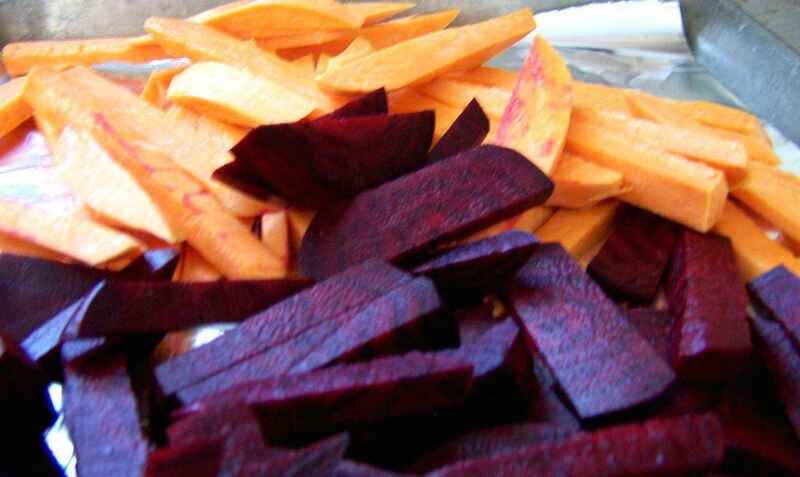 Celiac.com 01/17/2017 - Rich, juicy, earthy beets pair beautifully with silky sweet potatoes in this simple, satisfying dish that is perfect for the fall table. Ingredients: 3 medium red beets, peeled and cut into chunks 3 medium golden beets, peeled and cut into chunks 2½ tablespoons olive oil, divided 1 teaspoon garlic powder 1 teaspoon kosher salt 1 teaspoon ground black pepper 1 teaspoon sugar 3 medium sweet potatoes, cut into chunks 1 large sweet onion, chopped lemon juice, for serving, as desired Directions: Heat oven to 400F (200C). In a bowl, toss the beet chunks with ½ tablespoon olive oil until coated. Spread in a single layer on a baking sheet. Mix the remaining 2 tablespoons olive oil, garlic powder, salt, pepper, and sugar in a large resealable plastic bag. Place the sweet potatoes and onion in the bag. Seal bag, and shake to coat vegetables with the oil mixture. Bake beets 15 minutes. Place sweet potato mixture on the baking sheet, with the beets. Keep baking another 45 minutes or so, stirring halfway through, until all vegetables are tender. Celiac.com 01/12/2017 - Beets are not only delicious, nutritious, and in season, they make a great centerpiece for this tasty, gluten-free vegetarian dish that is sure to please. Ingredients: 4 - 6 fresh red beets, washed and trimmed 2 golden beets, washed and trimmed 1 bunch fresh arugula (about 1 ½ cups) 8 ounces of fresh hummus (or use this easy recipe) ¼ cup fresh or roasted pine nuts 1-2 tablespoons balsamic vinegar splash of olive oil, as desired Directions: Wrap beets individually in foil, place in baking dish, and roast in oven at 375 F. When beets are tender when pierced with a fork, remove them from the oven. Allow beets to cool. Discard foil. Peel and cut beets into quarters. Spread hummus over medium plate. Pile arugula in the center of the hummus. Arrange beets around the arugula, in alternating colors. Drizzle with balsamic vinegar, and a splash of olive oil, as desired. Top with pine nuts, and serve. Celiac.com 05/03/2016 - In many parts of the country, it's not uncommon to find some meat in your salad. 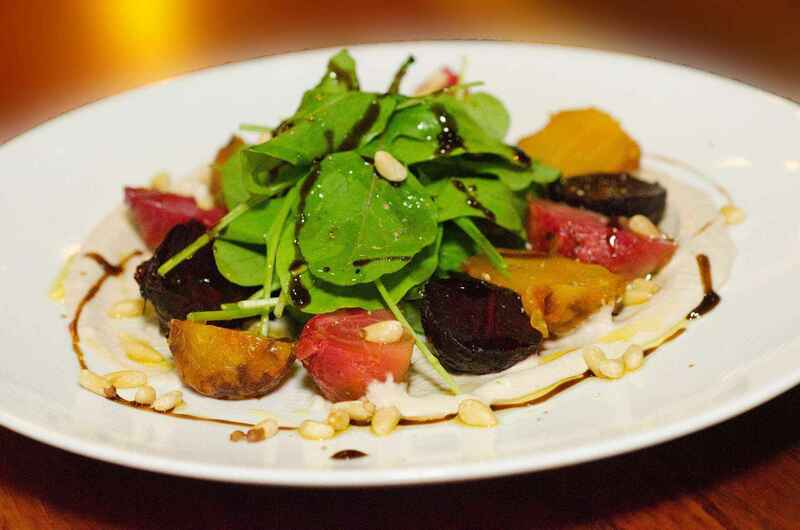 This recipe tops fresh greens with sweet oranges, roasted beets and sliced Tri-tip steak. Ingredients: ½ to ¾ pound tri-tip steak 3 green onions 2-3 cups baby arugula or mixed greens ½ cup fresh cilantro leaves 1 teaspoon ground cumin 1 sweet orange, segments 1 tablespoon olive oil 2 whole beets, roasted, peeled and diced 1 clove garlic 1 lime kosher salt black pepper Directions: Heat broiler and line a rimmed baking sheet with nonstick foil. Season the steak with the cumin and ½ teaspoon each salt and pepper and broil to desired doneness, 7 to 8 minutes per side for medium-rare. Transfer to a cutting board and let rest for at least 5 minutes before slicing. Meanwhile, place the oil and ¾ cup water in a large nonstick skillet and bring to a simmer. Add the garlic to the pan and cook, tossing, for 1 minute; remove from the heat. Grate the zest of 1 lime over the beets Add the roasted beets, then squeeze the lime juice over the mixture. Sprinkle with the parsley, scallions, and top with salt and pepper, to taste; toss to coat. In a large bowl, toss together the arugula, cilantro, then the beets and sliced steak.